Andrew Brown, BA ’06, is the founder of The Global Languages Group, which offers members of the GW community and the general public access to free language courses taught by native speakers, most of whom are GW students. By all accounts, it is a typical Thursday evening in early May in GW’s Marvin Center. Students grab a bite to eat and prepare for their last classes before hunkering down to final papers and exams. But those who venture to the third and fourth floors of the student center hear the sounds of unfamiliar languages floating out of several meeting rooms. At different points in the evening one can hear Hebrew, Ukrainian, Swedish, Polish, Hindi, Croatian, Bosnian, and Serbian. These are the sounds of GW students teaching their peers and community members foreign languages. BA ’06, founded the nonprofit GW student organization The Global Languages Group, which offers members of the GW community and the general public access to free language courses taught by native speakers. Most instructors are GW students, but a few members of the D.C. community also volunteer their time. The group had humble beginnings, with Brown teaching four of the five classes Global Languages offered in its first week. By the end of the school year, the group featured more than 100 student volunteers organizing and teaching about 55 free classes a week in 35 different languages, such as Farsi, Urdu, Slovak, Japanese, Albanian, Indonesian, and American Sign Language. The group also arranges weekly cultural events, including embassy visits, foreign film screenings, and lectures. A volunteer-run organization, Global Languages receives its funding from the GW Student Association. The group’s goal is to provide basic cultural and language knowledge to promote international communication and understanding. “Obviously, there is a need and a want for this, because this is a very international university,” said Brown. Brown, who received a Bachelor of Arts in international affairs from GW in May, has a working knowledge of 12 languages—he is fluent in at least six. He caught the language bug after spending a year studying in France during high school. Upon his return to the United States, Brown enrolled in language courses and taught foreign languages at schools and language institutes. He uses that experience to personally train each of the Global Language instructors, which now number more than 70. GW Olympic course participants visit the Visa Olympic Reunion Center in Torino, where they met with Scot Smythe, senior vice president of event marketing for Visa International. GW Olympic course participants cheer on U.S. athletes in Torino, Italy. Let the games begin! When those long-anticipated words were proclaimed this winter in Torino, Italy, Lisa Delpy Neirotti, director of GW’s master of tourism administration and sports management programs, was on familiar turf. One of the world’s foremost Olympic scholars, Delpy Neirotti has attended 14 consecutive games as an international sports management professional, beginning with the 1984 Winter Games in Sarajevo. Since joining GW’s faculty in 1991, she has shared her expertise and contacts with hundreds of the University’s business students, leading study abroad courses to the Olympic Games in Barcelona (1992), Lillehammer (1994), Atlanta (1996), Nagano (1998), Sydney (2000), Salt Lake City (2002), and Athens (2004). This year, she took 48 GW students to Torino as part of her popular three-credit course, “Behind the Scenes at the Winter Olympic Games,” a comprehensive, on-site look at organizing, marketing, and hosting the international mega event. For the first time, Delpy Neirotti offered two sections of the course this spring to accommodate tremendous student interest. “The pool of qualified applicants this year was the largest I’ve ever seen,” states Delpy Neirotti, who previously capped the course at 28 students. 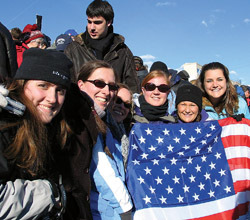 “Many of them noted in their application essays that the Olympics course was one of their primary reasons for choosing GW.” Half of the group—comprising 45 graduate business students and three undergraduates—visited Torino for the first half of the Olympics, while the second group attended the latter days of the competition. The course, which is the only one of its kind, met about six times on campus prior to the Olympics and re-convened in Torino, where students met with a variety of people involved with the games, including organizing committee executives, International Olympic Committee members, local government officials, corporate sponsors, athletes, and media. Delpy Neirotti also organized VIP tours of the venues and auxiliary facilities for the group. Highlights of the 2004 Olympics course in Athens included an invitation to the home of the U.S. Ambassador to Greece for a presentation about security issues, a discussion with Greece’s Minister of Tourism, a reception on the yacht of Alexander Spyrou, BBA ’73, whose London-based airship business was a vendor at the games, and a reception at a five-star resort sponsored by John Hancock, an Olympic corporate sponsor. The International Programs Advisory Council, comprising GW faculty members and administrators, reviews international education for the University. GW professor Michael Marquardt (second row, second from left) with one of GW’s human resource development master’s program classes in Hong Kong. GW’s human resource development master’s program is being offered at the Singapore Institute of Management in Singapore and at the Hopkins Training and Education Group in Hong Kong. Since its formation, SIM has played a major role in developing managerial skills and talent to support the rapid growth of the Singapore economy and is the leading private human resource development organization in Singapore. 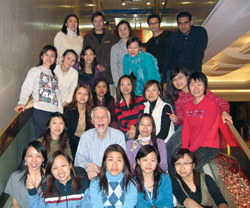 Hopkins is a leading provider of international degree and nondegree programs in Hong Kong. GW’s Human and Organizational Studies Program is committed to providing world-class, innovative education for students who are interested in helping people and organizations succeed in a world of continuous change. The program focuses on increasing the learning capacity of individuals, teams, and organizations to optimize corporate growth and effectiveness in the Asia-Pacific region and worldwide. Theory, research, and practice are balanced throughout the curriculum to enable students to develop and implement intervention strategies to increase organizational development and learning. The part-time program consists of 12 courses, offered every six to eight weeks for two years. The program is designed in such a way that the participants will not have to be away from their offices and duties for a long period of time. The learning approach is based on the direct involvement of the learner through the use of small groups, individual assignments, and group projects. Students have at least 30 hours of direct class time with the instructor and at least 15 hours of organized outside work for each course. The program occasionally awards a doctoral degree, subject to faculty advising availability and alignment of research interests. The Singapore program has just admitted its 10th cohort and has been in operation for 20 years with a 100 percent graduation rate. Hong Kong has just admitted its fourth cohort and has been in operation for six years with an 80 percent rate of graduation. It’s no secret that GW is a magnet for international students and scholars. The University’s privileged location in the heart of the nation’s capital, coupled with its widespread reputation for excellence, makes it a natural destination for academics from around the globe. Currently, 1,835 international students call GW home, along with some 400 foreign professors and researchers. GW’s International Services Office, directed by J. Greg Leonard, plays an integral role in their journey to GW, helping international students secure the necessary visas to study in the United States, as well as to navigate the subtleties of life here. 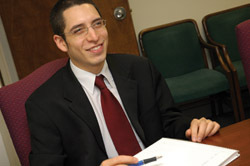 A long-time, nationally recognized international student services professional, Leonard came to GW last year from Massachusetts, where he served as director of the international students and scholars office at Boston University and acting associate director of the international office at Harvard University. Earlier in his career, he founded and served for 20 years as director of international student and scholar services at the University of Alabama, Tuscaloosa. Leonard, who oversees a staff of 15 at GW, says the field has changed dramatically over the years. “These days, we spend a lot of time resolving visa snags and helping international students comply with federal regulations,” he explains. Currently, the office is hard at work implementing a new software program to meet the government’s post-9/11 mandate to process and intensively track all university international visitors through the federal Student and Exchange Visitor Information System database. Oxford, England, is the site of the acclaimed GW-Oxford Program in International Human Rights Law, which celebrated its 12th anniversary this summer. The picturesque campus of New College in Oxford, England, provides a captivating setting for the renowned GW-Oxford Program in International Human Rights Law, a summer offering devoted to advancing the cause of human rights. Created and co-directed by GW Law Professor Ralph G. Steinhardt, the historic program celebrated its 12th anniversary in July. This year, 70 students from 20 countries participated in the popular, month-long series of courses, co-directed by Andrew Shacknove of the Oxford law faculty. More than 1,000 students from 85 countries have graduated from the program since its establishment in 1995. “In some respects, our graduates make up the largest Internet-based human rights law firm in the world,” says Steinhardt, who oversees an internationally recognized faculty from around the globe. A pillar of the human rights curriculum at GW Law, the GW-Oxford Program emphasizes advocacy and dissemination skills, as well as formal knowledge of human rights law, the means of its enforcement, and its status in a contentious world. Courses focus on the philosophy, history, doctrine, and practice of international human rights law. “Participants come away with an in-depth knowledge of human rights issues and a better understanding of how to contribute to the improvement of human rights conditions in their homelands and around the world,” Steinhardt says. Complementing the formal coursework are a series of afternoon electives addressing contemporary issues in the field, such as human rights and peacekeeping, the predicament of populations at heightened risk of human rights violations (including women and refugees), and human rights in the marketplace. Rounding out the curriculum are a human rights film series and lectures by leading authorities in the field, including members of the International Court of Justice and the European Court of Human Rights, human rights prosecutors, and human rights abuse survivors. 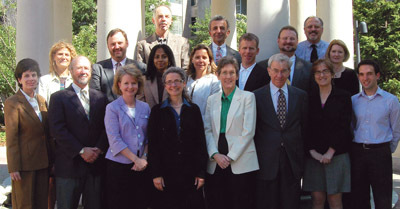 Over the years, GW-Oxford’s distinguished faculty has included leading human rights law practitioners such as Harold Koh, dean of Yale Law School; Richard Goldstone, first prosecutor at the Yugoslavian and Rwandan War Crimes Tribunal; Justice Albie Sachs, a founder of the anti-apartheid movement in South Africa and now a member of that country’s Constitutional Court; Radhika Coomarawamy, U.N. Special Rapporteur on Violence Against Women, and Juan Mendez, former president of the Inter-American Commission on Human Rights and now the U.N. Secretary-General’s Special Representative on Genocide. Like many students aspiring to a career in journalism, juniors Jillian Badanes, Ann Blake, Stephanie Robichaux, and Keisha Vaughan were frustrated by the discipline’s catch-22: Gaining an internship is nearly impossible without experience, and experience is almost impossible to obtain without an internship. So the students, who met in professor Myron Belkind’s introductory journalism class, took matters into their own hands by founding and editing GWanderlust, a travel magazine designed for the campus community. The first issue, published in May, is as varied in tone as it is in the geography it covers. Stories from students, professors and alumni explore destinations as somber as the mass graves at Phnom Penh, Cambodia, and as festive as the Winter Olympics in Torino, Italy. Contributors recount adventures such as traveling along the Lebanese-Israeli border and teaching Paraguayan children how to do the hokey-pokey. GW students Amalfi Parker and Catherine Villnave join Rachelle Heller, associate dean for academic affairs at GW’s Mount Vernon Campus, outside the Emirates Palace in Abu Dhabi, United Arab Emirates, during the second international Women as Global Leaders Conference. The stereotypical image of the Muslim woman was shattered for 12 GW professors and students this spring, when a select delegation from the University’s Women’s Leadership Program traveled to Abu Dhabi, United Arab Emirates, for the second international Women as Global Leaders Conference. Led by Rachelle Heller, associate dean for academic affairs on GW’s Mount Vernon Campus, the group joined more than 1,000 prominent women leaders from 87 countries for a cross-cultural discussion on women and global leadership. GW’s contingent, including Mary Buckley, coordinator of the WLP’s international arts and culture program; graduate teaching assistant Meghan Shea, BA ’04; and nine undergraduates signed on for the conference after submitting two successful proposals to serve as presenters at the gathering. The three-day event featured an impressive roster of guest speakers, including Her Majesty Queen Rania Al-Abdullah, Queen of the Hashemite Kingdom of Jordan; Hon. Mary Robinson, former president of Ireland and U.N. High Commissioner for Human Rights; Cherie Booth, wife of U.K. Prime Minister Tony Blair and noted British attorney and human rights advocate; and Linda Ellerbee, award-winning journalist and television producer. The group also visited Zayed University, a women’s college with campuses in Dubai and Abu Dhabi, which hosted the conference. GW has a special link to the university, as C. Dianne Martin, professor of engineering and applied science, is currently serving for two years as dean of Zayed’s College of Information Systems. Everyone came away from the experience eager to continue the engaging global dialogue. “The conference presented our students with a wonderful opportunity to join a worldwide community of scholars,” Heller says. GW’s department of engineering management and systems engineering recently completed a successful project with the Republic of China Air Force in Taiwan. GW offered an engineering management Master of Science degree program with a focus on logistics management to select ROCAF officers. After being nominated by their superiors and meeting GW’s entrance requirements, 57 Taiwan Air Force Academy graduates earned GW master’s degrees. The program utilized the cohort model, whereby all students attend all classes together in sequence. Shahram Sarkani, professor of engineering management and systems engineering and head of the department’s off-campus programs, administered the program and served as faculty adviser to the students. Collaborating with Sarkani throughout this program was professor Thomas A. Mazzuchi, department chair. Faculty members with a solid grounding in the daily application of their knowledge to government, industry, and military issues taught the courses. The program, offering 24 courses over four years, ran from January 2002 through December 2005. Because GW took the program to Taiwan and used American instructors, the ROCAF gained an American education for its handpicked officers without having to send them overseas. Timothy W. Tong, dean of GW’s School of Engineering and Applied Science, traveled to Taiwan a number of times to support the program. And in June of 2005, GW Executive Vice President for Academic Affairs Donald R. Lehman led a delegation to Taiwan, accompanied by Tong, Mazzuchi, and Sarkani. Together they joined goodwill meetings with students, program officers, and the Republic of China Ministry of Education. Conducting the program on site in Taipei and Tainan earned GW recognition among many people in the area, helping to make known the academic reputation of the University. Subsequently, GW’s name recognition led to the launch of another cohort master’s program in Taiwan in 2003, this one in cooperation with the China Industrial & Commercial Research Institute in Taipei. The CICR program is ongoing, with the fourth cohort to begin in Fall 2006. Amy Fiedler, a second-year medical student, collaborated with other medical students to form Books Without Borders after traveling to the African nation of Eritrea and seeing the limited number of available medical textbooks there. Imagine going through medical school and sharing an anatomy textbook with nine other students. This is the reality for men and women at the Orotta School of Medicine in Eritrea, located in Eastern Africa bordering the Red Sea, Sudan, and Ethiopia. Books Without Borders, a GW medical student organization whose goal is to annually donate medical textbooks and literature to medical schools in areas of need, is working to provides books to Orotta students. After collaborating with other first-year medical students, Books Without Borders began to take shape. The massive book collection began in early January 2006 with donation boxes scattered throughout Ross Hall and the Himmelfarb Library. During the following five months, Books without Borders collected more than 1,000 books and 5,000 journals. “These donations far exceeded our expectations,” Fiedler says. Books Without Borders aims to eventually establish the first medical library in the country of Eritrea and reduce the student-to-book ratio to four to one. Physicians for Peace also rallied behind the cause by packaging and shipping all donated materials free of charge to Eritrea in late May. Distribution and organization of the books will be a daunting task, but Fiedler hopes GW will be able to offer some assistance. “We could never have done this without the support of everyone at GW,” Fiedler says. “I am really thankful that people think this is a worthy cause.” Fiedler explains that Himmelfarb “has been absolutely critical.” The library volunteered to store all the books and journals until shipment time. In addition, Books Without Borders has had enormous support from the Medical Center administration, the International Medical Programs Office, and current students. 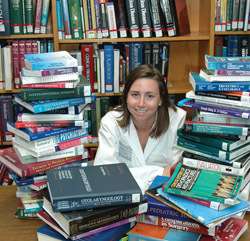 Books Without Borders is developing relationships with other medical schools in the greater Washington area. In its second year of operation, Books Without Borders will explore the possibility of publishing companies donating new medical books or complete sets as it continues to collect donations for underserved medical schools. 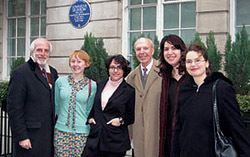 In February, a contingent of GW community members traveled to England to honor American journalist Edward R. Murrow (1908-1965), with an English Heritage Blue Plaque. GW was represented at the ceremony by Michael Freedman, vice president for communications and former CBS Radio Network News general manager; Richard C. Hottelet, a member of the “Murrow Boys” who covered World War II for CBS Radio, now a GW Welling Presidential Fellow; and Sam Litzinger, former CBS News correspondent, an anchor on Washington Post Radio now host of the GW-produced XM Satellite Radio series “From the Nation’s Capital.” Litzinger nominated Murrow for the honor. The plaque was placed at Weymouth House, 84-94 Hallam Street in London, where Murrow lived from 1938 to 1946. GW students studying in England during the spring semester and alumni living abroad were among the guests at the ceremony. Also in attendance was Daniela Passolt Olimpio, resident director of GW's England Study Center. In 1991, the Internet was in its infancy, the former Soviet bloc was fading into the global background, and hope was high for a new world order. Meeting the need for a forum for student scholarly discussion of the rapid changes taking place in an increasingly globalized society, GW’s International Affairs Review was born. While the world’s most pressing issues may have changed since 1991, IAR remains a premier journal for graduate students around the world to publish their theories on economics, development, security, and technology on an international level. The publication is a graduate student-run scholarly journal published biannually. Now in its 15th year, the journal strives to remain on the pulse of current and future trends on the academic global scene. A peek into current topics for the Spring/Summer 2006 issue reveals that the journal addresses a wide variety of topics from maritime piracy to terror groups. “By bringing scholarly weight and analytical rigor to bear on real-world problems, this journal has made real contributions to our understanding of these issues,” says Elliott School of International Affairs Dean Michael Brown. As a scholarly journal published in the very city where most major international decisions are made, IAR and its panel of editors can track current academic trends in international affairs and provide decision makers with possibilities for alternative solutions to potentially catastrophic dilemmas. To celebrate 15 years of publication, the journal has expanded its scope to include sales on amazon.com and has utilized its Web site to provide a space for archives of past journals. As society becomes increasingly interconnected, publications like the IAR will ensure that GW’s academic community stays on top of international research. Dobet Gnahoré, a performer with the Acoustic Africa tour, will make her DC debut at Lisner Auditorium Nov. 12. 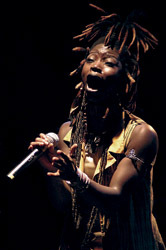 She sings in several African languages and was trained in the music and dance traditions of the Bété people in her native Ivory Coast by her father, Boni Gnahoré, a well-known performer in West Africa. 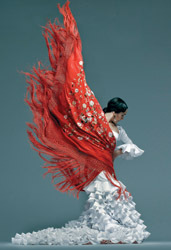 As part of Lisner’s presentation of the critically acclaimed annual D.C. Flemenco Festival, Flamenco superstar and choreographer Sara Baras performs in a popular show that attracts much attention, including media coverage from the Andalusia region of Spain. Daniela Mercury, the Brazilian superstar known as the “Queen of Axé music,” performed at Lisner in October as part of the “True Rhythms” series, which also included a performance by Peruvian vocalist Eva Allyón. Khaled, the “King of Raï,” performed music at Lisner that has its origins in Bedouin oral traditions. Khaled helped transform and electrify the raw music style in his native Algeria and then went on to make it part of the global music scene. To view performances scheduled for the upcoming season, visit www.lisner.org. Dance professor Maida Withers’ latest dance creation, Thresholds Crossed. Walking into Maida Withers’ office on the second floor of the Marvin Center, one is greeted by an eclectic collection of memorabilia from her dance-related trips around the globe—a poison arrow from Brazil, a Korean mask, trinkets from Africa. “Every time I look at them, they remind me just how full my life is,” says the renowned professor of dance. The world has indeed provided a colorful backdrop for Withers’ acclaimed dance creations. Equally comfortable holding open auditions in Moscow to cast dancers for her new production, Thresholds Crossed, or staying up all night in Finland with top scientists to search for auroras—the mystic luminaries of the Arctic skies, as inspiration for her “Dance of the Auroras,” Withers has carved out a unique niche for herself in the post-modern dance movement. As she celebrates her 40th year at GW and the 30th anniversary of her acclaimed Washington dance troupe, The Dance Construction Co., Withers has no intention of slowing down. April 21 marked the world premiere of Thresholds Crossed, Withers’ new dance creation, presented by GW’s Lisner Auditorium. A kinetic fusion of East and West, the evening-length, multimedia dance work explores the events, ideology, and humanistic issues that link the United States with the former Soviet Union and contemporary Russia. Featuring U.S. and Russian dancers, the work is a culmination of Withers’ 11 research tours to Russia since 1997. During her tenure at GW, Withers has constructed more than 75 original dance works and has received numerous awards, including the 1999 Columbian Professorship Award, the prestigious Pola Nirenska Lifetime Artistic Achievement Award in 2001, a Fulbright Travel Award to Taiwan, and the distinguished 2005 D.C. Mayor’s Arts Award for Excellence in an Artistic Discipline. She has performed, conducted dance workshops, and published in 17 countries, including Korea, China, and Brazil. 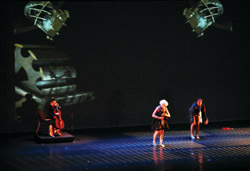 At press time, Withers was arranging an April 2007 multicity tour of Thresholds Crossed in Russia.